Your ideal Audi, BMW or Mercedes? 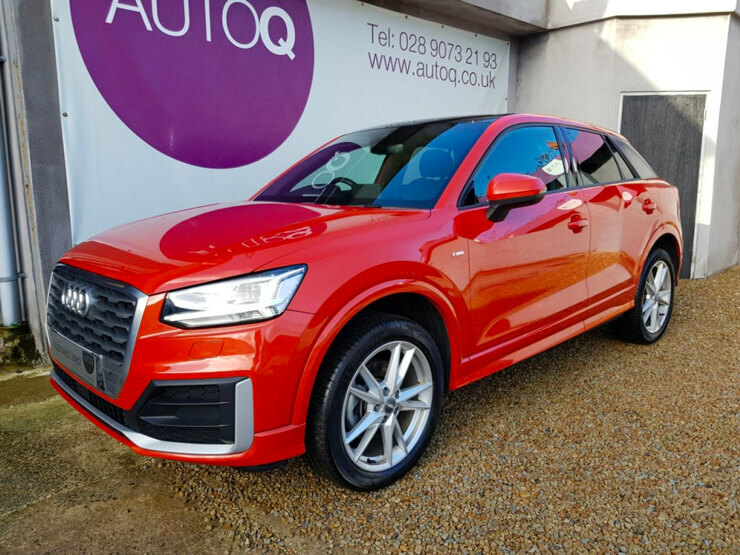 At AutoQ, many of our customers appreciate the reliability and well-engineered driving feel of German cars...especially the ever-popular Audi, BMW and Mercedes models. While we have been supplying almost every brand of car to our repeat customers in Belfast NI for generations, these three marques in particular are always in demand! If you're in Belfast or NI and interested in finding out why Audi, BMW and Mercedes cars are especially sought after as used cars, our guide will help with knowing what to watch out for in our stock list. Of course, we're not only a leading independent used car dealer but we're a dealership where every person takes great pride in our no pressure, helpful approach. Therefore...if you need help, just ask! We have decades of expertise on hand and you won't find a 'hard sell' here. Just a friendly welcome. Those Audi, BMW and Mercedes models to look out for? We've included a few below. There are plenty of others -- of course -- but these are a starting point. Audi A1: Could, perhaps, be considered Audi's answer to the Mini but featuring Audi's strong, refined designed and solid, quality driving feel. For those shopping for a smaller city car like a Seat Mii or similar, an A1 could be worth a test drive to stretch the budget a little and see why Audi considers this to be an urban car with plenty of talents beyond the city too. Variations in styling, such as the two tone examples and S Line models plus special editions, add an extra touch. However, a sign of a car featuring great design is found in the fact that the A1 looks superb in any guise. It's no surprise, then, that Jeremy Clarkson said the S1 model he tested was "fast, fun and beautifully made". Audi A3: Described by Top Gear as "the definitive example of rock-solid, sensible, impeccable German engineering" this is a giant in its class and understandably so. Audi's smaller family car has been a trusted go-to thanks to driving characteristics with the feel of a much more expensive car. Performance-wise, model options including the S3 give plenty of options perfect for the frugal right through to the sportier enthusiast while options including S Line leave drivers spoil for choice. Audi A4: Another class-topping Audi with great popularity, a superb all-rounder delivering comfort and refinement for any use with added practicality. A4 models have changed again and again across the years, with the more recent examples delivering a sharp and assured drive while delivering as a multi-purpose vehicle every time. What Car said this about their admiration for the A4: "To say we like the Audi A4 is like saying cats like the odd drop of milk. In fact, we like the A4 so much that it's our current Executive Car of the Year and 2016's overall What Car? Car of the Year." Audi A5: A truly classy performer with a uniquely refined drive. 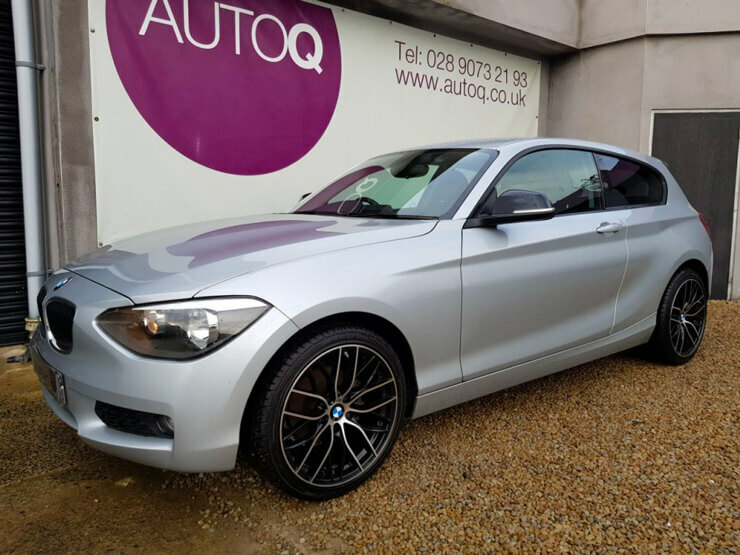 A current AutoQ example sports leather seats, B&O sound system and S Line Black Edition spec, giving an overall driving experience that's hard to rival. That's also thanks to a superb auto 'box. The i newspaper praised their Quattro test model in the highest terms: "While the coupe name and quattro badge might bring up memories of the fierce cars of the 80s and 90s this current A5 is really a different prospect. It's still quick and capable but with a thick veneer of comfort and refinement on top that make it an easy companion for day-to-day life." Always popular with AutoQ customers, great A5 examples like the above bring great feedback from returning customers...and understandably so! AutoQ's Audi staff pick: Conor, AutoQ Marketing Manager, rates the Audi TT, explaining that "for a car you can drive every day it has a really sharp, 'planeted' feel and is one of the best all-rounders you can find without stepping up into no-compromise sports cars...and all their impracticalities". BMW 1 Series: Many years ago, it was said that 80% of people who were new to the BMW brand but bought a BMW Compact would go on to buy a second car as their next choice. We could understand why this could be the case with the 1 Series too, with economic variations bringing rear wheel drive and that BMW 'feel' into a wide range of budgets and higher performance models attracting plenty of praise for their nimble driving characteristics. Auto Express summarises the 1 Series difference by enthusing that the "enjoyable driving experience is one of the 1 Series' biggest selling points, with every version providing the sort of rear-wheel drive balance that the competition cannot match". BMW 3 Series: A favourite with AutoQ customers for decades, with a large group of customers ever-loyal to this particular model buying into one generation of 3 Series after another thanks to its balanced, agile driving manners. It is notable that the 3 Series has been on Car and Driver magazine's annual Ten Best list 22 times, from 1992 through 2014, making it the longest running entry in the list. In their December 2009 issue, Grassroots Motorsports magazine named the BMW 3 Series as the second-most important performance car built during the previous 25 years. Those lucky enough to drive away in a BMW M3 model even have the satisfaction of knowing that their car is a future classic, not to mention being a colossal presence in the current BMW offering to boot. BMW 5 Series: A luxurious all-rounder bringing outstanding practicality and a distinctive, weighty and assured driving style some customers never stray from across a lifetime of driving. More recent iterations, including those with the attractive M Sport spec, offer a very high standard of cabin and equipment. A pleasure to drive (as our customers would agree!). BMW X3/X5: Deserving of a test drive as these SUV BMWs offer a familiarity of driving experience reminiscent of the 5 Series and don't compromise on appeal as a driver's machine where some other SUVs fall short. The X3 is of particular note as, although the cabin is relatively compact for an SUV, the overall driving feel, practicality and running costs could be the all-round answer to your motoring needs. AutoQ's BMW staff pick: AutoQ Business Development Manager Chris is a huge fan of the BMW M3 thanks to "its aggressive looks and performance and the fact that they are now a relatively scare sight on the roads". Mercedes A Class: Increasingly in demand with Auto Q customers, the attractive examples we seek out are rarely with us for long! Genuinely a great way into the refinement and quality of the Mercedes range but with the practicality and running costs of a smaller car. Car Buyer points out that the "classy interior" of the A Class can make it a "desirable" car that "can be highly affordable to run" while the purists at Evo magazine add that "interior upgrades coupled with a few exterior changes" have "put the A-class right up to the top of its class". The finish and spec of a higher-spec model really creates a head-turning option for car-hunters. Mercedes C Class: Don't ask us to choose our favourite between the A4, 3 Series and C Class -- many of our customers have strong feelings on the subject we'd rather not tangle with! One thing is certain, the C Class is a sophisticated option with a distinguished, rounded feel many consider to be near-peerless. AMG spec options and a range of engine sizes mean any number of ways to put luxury and style on your driveway! 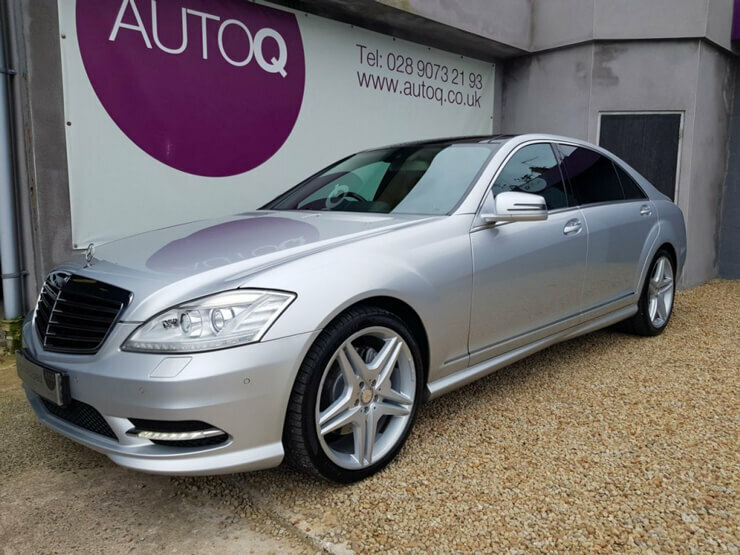 Mercedes S Class: Worthy of special mention as the timeless S Class defines luxury motoring and has a small but devoted following of Auto Q admirers! A connoisseur's car with a feel of high-end indulgence, a test drive in an S Class could bring you into its ranks of sophisticated followers! Auto Q's Mercedes staff pick: Business Manager Craig thinks the arrival of the CLA45 brought a strong, fresh look to the Mercedes range and will enjoy finding some choice examples for AutoQ customers! New to AutoQ? We're a leading independent specialist for used car sales in Belfast NI. We can source the perfect car for your needs AND we may be able to sell your old car on your behalf. You can even apply for finance online. We're proud to be different: the AutoQ promise is a friendly welcome, a relaxed approach with no pressure selling. Our devotion to those happy, returning customers has made us a trusted name for over 30 years. Call us - we're here to help. Brilliant professional business to deal with during the purchase of the car. Also great after care provided by the service centre.